Focused on Story: How to Begin Recording Your Life Story Part 2 Opening up your memories and organizing your story. 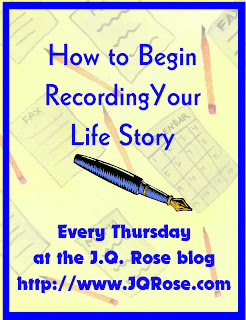 How to Begin Recording Your Life Story Part 2 Opening up your memories and organizing your story. Opening up your memories and organizing your story. Did you try drawing your time line? Some of us have more years to include in that line and a lot more stories to tell about our lives. Don’t get overwhelmed with the length of that line. Celebrate it! Remember you eat an elephant one bit at a time. So pick and choose stories that you have shared many times with friends and family. Begin by writing that story down or making notes for your audio or video recording. You've told it or heard it many times, so it should be easy. Have fun with it. I began memoir writing by telling our daughters’ birthday stories. When they were kids they loved hearing about the day they were born so I set it down on paper. They were adults when on their respective birthdays, I slipped the story in their birthday card. They were delighted. As each grandson arrived, finally a granddaughter, I recorded the story of their birthday too and gave it to the mom as a keepsake for the child. Free Writing--Choose a topic from your memory bank and begin writing about the topic. Don't stop to plan it out, just begin writing and don't let your pen or pencil leave the page or you fingers leave the keyboard. Let it flow. Never mind about grammar and punctuation because noone is going to see this except you. Be sure to include your emotions about the topic and let it all out. Here are some topics to choose from to give you an idea--automobiles, travel, sports event, fine arts production, a relative, pets, and toys. I Am From Poem--Get your creative juices flowing with this poem which will allow you to pull out memories and set them down in poem form. This exercise is taken from the Chrysallis website. Visit it to read how several folks filled in the blanks. From the _______ (specific family story about a specific person and detail), the _______ (another detail), and the _______ (another detail about another family member). Talented writer and friend, Tanja Cilia, shares her touching poem that she created using this template. Thanks so much, Tanja. I think this will certainly stir us to try writing the poem about our life story. I am from sea-urchins and anchovies, and from Lighthouse Sea Salt and the Mediterranean’s best-kept secret island... I am from the Grand Harbour view flat, cosy, homely, comfortable, an islander who feels as much at home in the water as outside it. I am from the tiger lily freckles and the honeysuckle tendrils, and orange blossom water used as scent because it smells faintly of 4711. I am from the lion rampant holding the fleur-de-lys; the stubborn and the witty, the tall and the big-footed. I am from the Paul and the Catherine, but also from Valletta, Vittoriosa and Zabbar. I am from the parsimonious yet generous, proud yet humble, solitary yet friendly clan. The ones who lisp. From the intelligent and gifted and clumsy and inept. The bookish. The let’s do crafts but not homework especially if it’s mathematics. I am from the Catholic Pessimist and Jewish Cynic and Agnostic Believer. I read and I write and I empathise with most. I'm from Malta, land of honey, capers, prickly pears and olives, from if I’ve told you once I’ve told you a thousand times. And Linz in Austria. And Foggia in Italy. And anchovy and spinach pie and rabbit stew and vegetable soup with ham hock. From the person who had stalls in the marketplace, from the person who did bobbin lace without using a pattern, from one who preserved fruits and vegetables and sold them to support her family, from the person who made designer patchwork quilts from fents. I am from the sideboard drawers bursting at the seams with millions of photographs in sepia and monochrome. I am from Alexandria, Egypt, but also from a cauldron of Phoenician, Carthaginian, Norman and French genes. Please feel free to work on this poem for the next several weeks, then come back and post your poem in the comments section. Yes, I WILL reward you with a fun prize if you do so. Have fun with it and yes, you can tweak this however you wish. Now is the time to begin writing your story. But how do you organize all these anecdotes, these precious times in your life? There is no hard and fast rule about how to organize the stories. I do believe each person has to take some time to first write the easy stories to tell. Once you start writing and conversing with friends and family about the old days, so many stories will surface. Write them all down without worry about organization. Keep them in your three ring binder. 1. Themes--The more you write the more you may discover there are themes to your stories. There may be several accounts about being a caretaker for your parents, a hobby you love, pets you have had over the years, the story of an illness. birthings in your life (not only your birth, but the birth children or family members, ideas, businesses.) Each topic will be a theme which you can expand. 2. Chronological Order--It is easy to write only the facts when writing chronologically, but in life stories writers need to include their feelings about what is happening to them in their lives. Describe the people and location where the story takes place and allow the reader a chance to step into the scene. Remember to show, not tell, the story. 3. Relate happenings in the present to something in the past e.g. the movie/book Julie and Julia. The story follows the exuberant chef, Julia Childs in the past and the present story of Julie who decided to write a blog about making every single recipe in Julia’s cookbook every day for a year. When writing your memoir, remember your journalism class and the prof expounding on the five w’s—who, what, where, when, why, and how. It is very important to explain to readers of the future who this person is and how he/she is related to you, the location, the dates when the action takes place, and why this particular episode in your life is significant to you. In every good story, there must be more showing than telling to keep the reader’s interest. Dialogue is an interesting way to help move the story along. Using the five senses immerses the reader into the story. Include interesting characteristics of your subject to bring them to life. I have a woman in our family, who shall remain nameless, who picked her nose all the time she talked to me. Maybe you have an uncle like I did who prayed and prayed and prayed before a meal. And how about my aunt whose mustache was so dark that when she died, the undertaker shaved it off and nobody recognized her in the casket? Hope you're all geeked up to begin writng about your life. Jump right in and go for it. It doesn't have to be an award-winning epistle. Just do it. Let me know how you're doing by leaving a comment below or drop me an email at jqrose02 at gmail dot com. Feel free to ask questions. Thanks for stopping by today! After writing feature articles in magazines, newspapers, and online magazines for over fifteen years, J.Q. Rose entered the world of fiction beginning with mysteries, Sunshine Boulevard, and Coda to Murder, published by Muse It Up Publishing. With Girls Succeed!, a non-fiction e-book for girls, she returned to her first love, writing about real people. Because Thursday, July 3 is so close to the holiday, the next posting for Life Story Writing will be on July 10. Please come back then for more on this topic. I bet you may have time to work on some stories. Best wishes!